Blepharoplasty, also known as an eye lift, is a procedure that corrects the sagging or drooping of the eyelids and removes excess fat, skin and muscle. As we age, it is common to see a difference in our eye area – loose skin, bags below and above the eye; sometimes so much that the upper lid seems to disappear underneath the extra fatty area under the brow bone. Even with good skincare and eye care, wrinkles, puffiness and drooping eyelids can still happen. Genetic factors and body chemistry can even cause these premature aging effects in younger people. Blepharoplasty can give a more youthful appearance to tired looking eyes. Blepharoplasty surgery can also treat a medical condition called ptosis (drooping eyelid), caused by poor muscle tone or nerve damage. Ptosis causes the eyelids to hang very low and block vision. 1: Upper eyelid blepharoplasty: removes excess skin, fat and/or muscle from the upper lid. 2: Lower eyelid blepharoplasty: removes excess bags and sometimes skin at the lash line to tighten the under eye skin. Is Blepharoplasty (eyelid surgery) Right for Me? The best candidates for blepharoplasty are generally physically healthy and are well informed about the surgery. Typically candidates are at least 35. Genetic factors may indicate treatment for younger people. 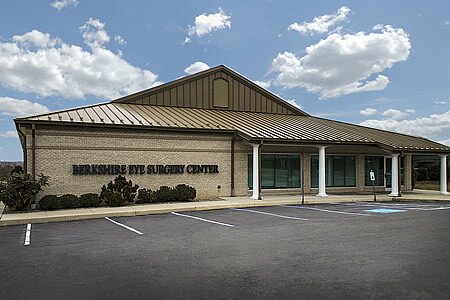 If you are interested in learning more about Blepharoplasty at Berks Eye Physicians & Surgeons, schedule an appointment with us today. If you are interested in blepharoplasty, we recommend you schedule a consultation at Berks Eye Physicians & Surgeons. At your consultation your doctor will discuss your goals and expectations and help you decide what procedure would benefit you based on your specific needs. At the time of surgery, you will be given a local anesthesic to numb the area around your eyes and a mild sedative to help you stay relaxed during the procedure. You’ll be awake during the surgery, but relaxed and insensitive to pain. The blepharoplasty will take between 30 to 40 minutes, depending on the extent of the surgery. A small incision is made following the natural line of your eyelids, excess fat is removed and sagging skin trimmed, and the incision is closed with very fine stitches. You should be able to read or watch TV in two or three days. Most people feel ready to return to work within a few days.